A sense of humor is what lead me to my eventual career choice, funny bartender, and then, finally, New Yorker cartoonist. And a sense of humor is why, having edited 400 books of my own cartoons, I was asked to pull together the collection you now hold in your hands. My assignment? 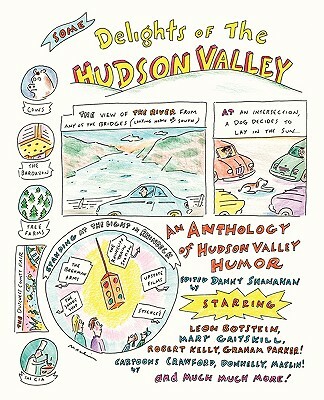 Contact varied and interesting contributors living or working in this area we love, the Hudson Valley, then beg them to come up with funny material. The response was truly astounding, even to a jaded jaguar man like myself. The brilliant conductor/writer/college president Leon Botstein is here, along with the legendary singer/songwriter/rocker Graham Parker. Writer/poet/professor Robert Kelly shares a laugh, as does (out of slashes-must use alliteration) local literary luminary Mary Gaitskill, chiming in with a truly hilarious cartoon (who knew?). We have stars of stage and screen: Denny Dillon, Mary Louise Wilson, and Lou Trapani, to name a few. Rounding things out is a bevy of cartoonists and writers, artists, and poets, and whether you prefer a sly, knowing grin, a satisfied chuckle, or a full-out braying guffaw, all will make you laugh. So enjoy already. And don't forget to tip your bartender.